Hummer Transfer & Ride: Give it some Bling! Every time you see a limo after this, it will put a smile on your face! This ride will ensure you receive a fantastic start to your stag do weekend in Prague. You will travel IN STYLE in this chauffeur driven Hummer Limo equipped with 2 bottles of complimentary bubbly. Available from the airport, bus or train station to your hotel, apartments (or reverse). Ask for details. There are only a few of these cars in Prague, and they are very popular, so book early to avoid disappointment. 15 people and over should book a second car. 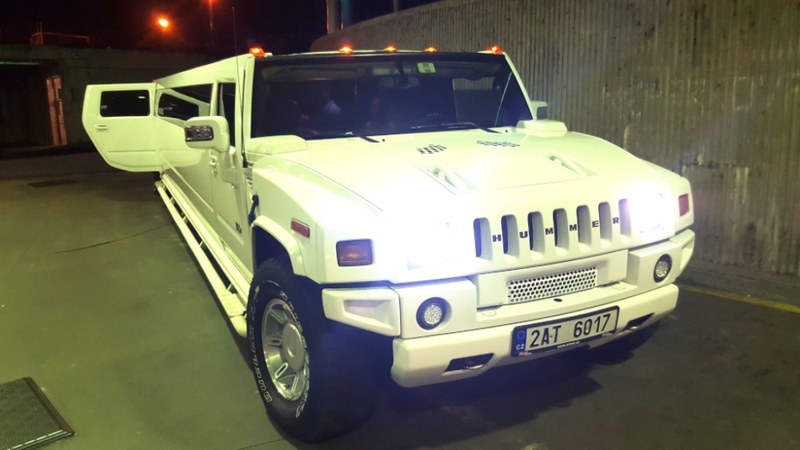 There are only 2 Hummer Limos in town, so maximum capacity is about 28. There is also a luggage car included in price for your maximum comfort during this luxurious ride. This can be booked as an airport transfer OR as a ride round the city (a great pre-party activity!). You can even add a stripper – please ask for further details! Note: The 1 hour is counted from pre-booked time, not from the point when you all get in the car. That means you have to get there at the agreed time, or you'll have less time in the limo ride! It will be necessary to add a car for your luggage for the airport transfer. After you’ve got into Prague, why not hit the ground running with a Prague bar crawl – see the best nightlife spots in the city, and get happy while you do it!